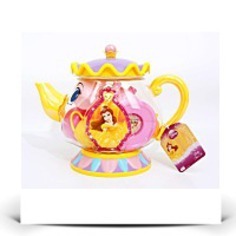 Enjoy a tea party with your favorite Disney Princess. Age 3+ Perfect for any tea party! All pieces are plastic. 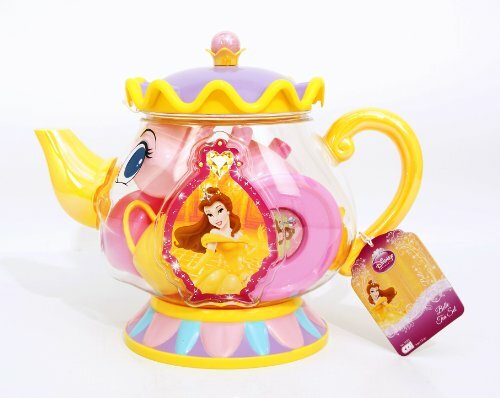 Set comes inside an enormous tea pot shaped storage container that looks like Mrs. Potts with Belle's picture on the side. Set consists of one big tea pot shaped storage container, 4 tea cups with handles, 4 plates, 4 spoons, sugar bowl, creamer pitcher, and a matching tea pot. Dimensions: Height: 12.5" Length: 11" Depth: 6.5"
Package Dim. : Height: 7" Length: 12.9" Depth: 10.9"